Men carry a body bag during rescue operations at a flooded mine in Kadoma, Zimbabwe, Feb. 16, 2019 (AP photo by Tsvangirayi Mukwazhi). Zimbabwe’s informal mining sector is in the spotlight after an accident at a gold mine killed at least 24 people last month. 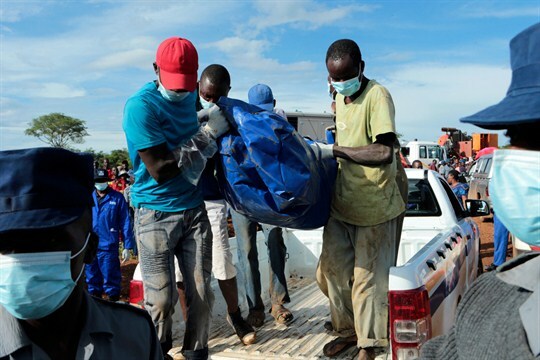 As many as 70 informal miners were believed to be working inside two abandoned mineshafts near the town of Battlefields, southwest of Harare, when the underground tunnels were flooded by water from a burst dam. Eight miners were rescued but others are unaccounted for and feared dead, as authorities struggled to drain water from the shafts.